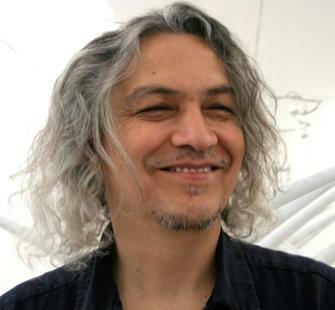 Chico MacMurtrie is internationally recognized for his large-­‐scale, performative, robotic installations, and interactive public sculpture. MacMurtrie has exhibited widely in America, Europe, and Asia, and has received numerous awards and grants, including five grants from the National Endowment for the Arts, Fundación Telefonica / Vida Life, NYFA, Art Matters, CEC Artslink and Ars Electronica. MacMurtrie is the Artistic Director of Amorphic Robot Works (ARW), a collective of artists, technicians, scientists, and engineers he founded in 1991. Since 2005, MacMurtrie/ARW have focused on developing “soft machines” or inflatable robotic sculptures that engage their environment through cyclical air exchange and metamorphic transformation. In 2012, MacMurtrie, Geo Homsy and Bill Washabaugh won San Jose’s Climate Clock competition with Organograph, a proposed 75-foot tall kinetic sculpture responding to Climate Change.